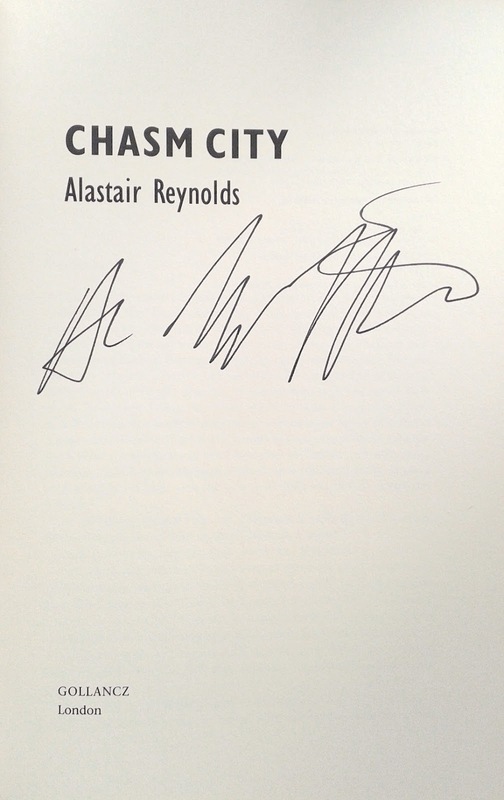 If I ever get the chance to meet Alastair Reynolds, I've a lot to thank him for. 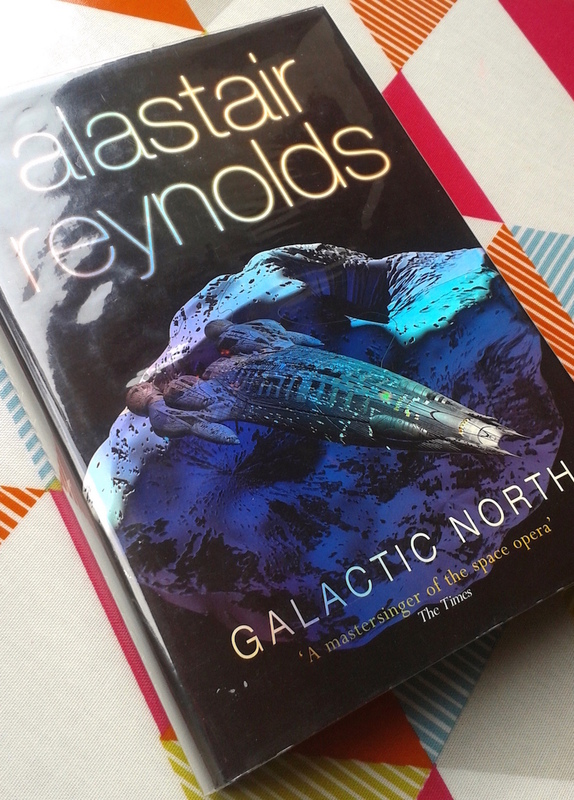 Not only have his books helped fuel the science fiction reading and collecting odyssey I embarked on six months ago, but his afterword in his 2006 short story collection Galactic North – a first edition of which I picked up in Oxfam Books in Brighton for a couple of quid – has informed and shaped it too: acting as a guide through the kind of modern hard/operatic SF in which I've become interested, introducing me to SF authors of whom I was previously unaware – John Varley, Gregory Benford, Paul McAuley, others besides – and opening my eyes to a handful I was, such as Larry Niven, Samuel R. Delany, M. John Harrison, Stephen Baxter, Bruce Sterling and Iain M. Banks. Perhaps the biggest revelation – if you'll excuse the pun – has been Reynolds' own Revelation Space universe, a future history comprising five novels and twelve novellas and short stories (to date; there's another novel due next year) – Galactic North being a collection of most of the latter. 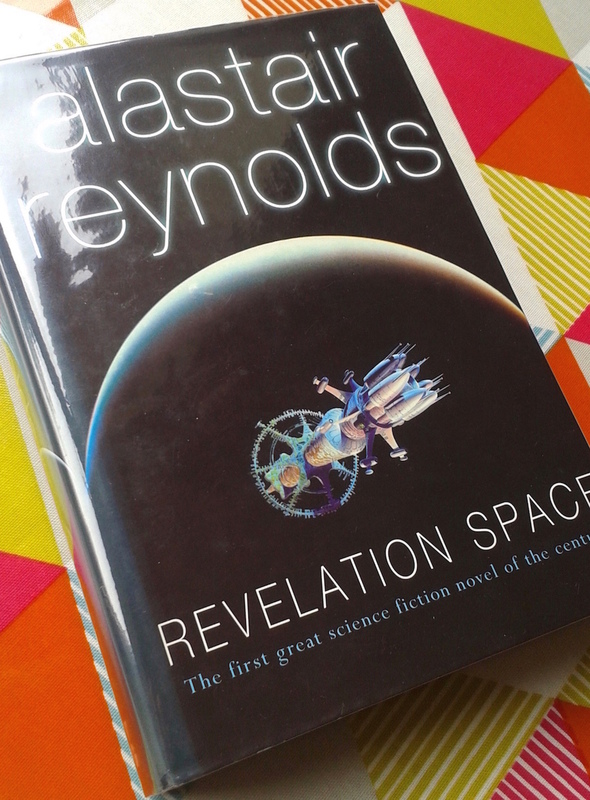 Sprawling yet tightly choreographed – at least it seems so to me; Reynolds himself has confessed that he's unconcerned with inconsistencies from book to book – the stories span tens of thousands of years (although the bulk concentrate on the 25th–27th centuries), depicting a technologically advanced but plausible future of sub-light interstellar travel (with its attendant – and to me fascinating – suspended animation – "reefersleep" to use the vernacular – and time dilation), planetary colonisation, warfare and plague, populated by a splintered humanity comprising various conflicting factions (hive-minded Conjoiners, cybernetic spacefaring Ultranauts, etc.) and haunted by long-dead but still influential alien races (arguably the least plausible aspect of the stories, but hey – who's to say?). 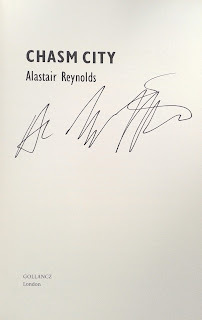 To date I've only really skimmed the surface – I've read the first-published novel, 2000's Revelation Space, plus a good number of the short stories and novellas, and I'm partway through the second-published novel, 2001's Chasm City – but even so I've become mildly obsessed. Accordingly, I've been picking up here and there Gollancz first editions of Revelation Space universe books, with their distinctive Richard Carr-designed/Chris Moore-illustrated dust jackets and covers (and in most cases distinctive dimensions: a whopping 10" x 6.5" – roughly royal octavo – rather than the standard 9" x 6", or octavo). Partly out of necessity (I am, as I've noted previously, a man of slender means), partly as a challenge, I've restricted myself to relatively cheap copies. 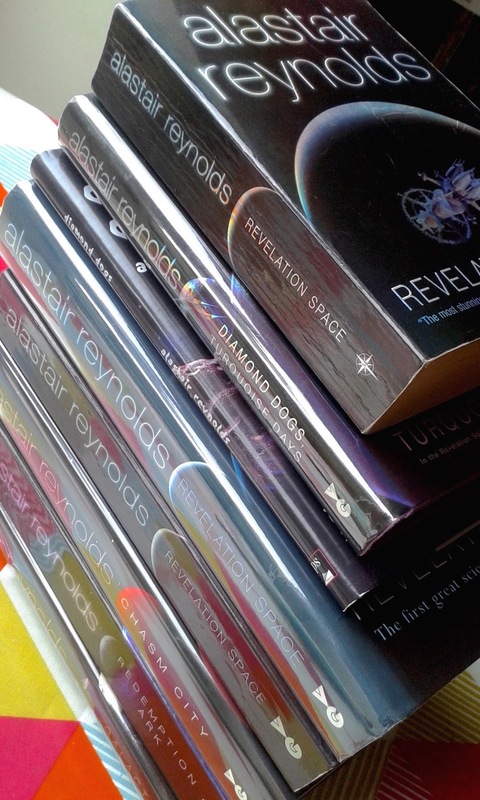 Aside from the aforementioned Galactic North, in Camilla's Bookshop in Eastbourne I dug out from the teetering piles of SF a 2002 first trade paperback printing of Redemption Ark (the third-published Revelation Space universe novel, and a direct sequel to Revelation Space), priced at £3.50, and a 2003 hardback first of the two-novella collection Diamond Dogs, Turquoise Days, priced at £2.50. 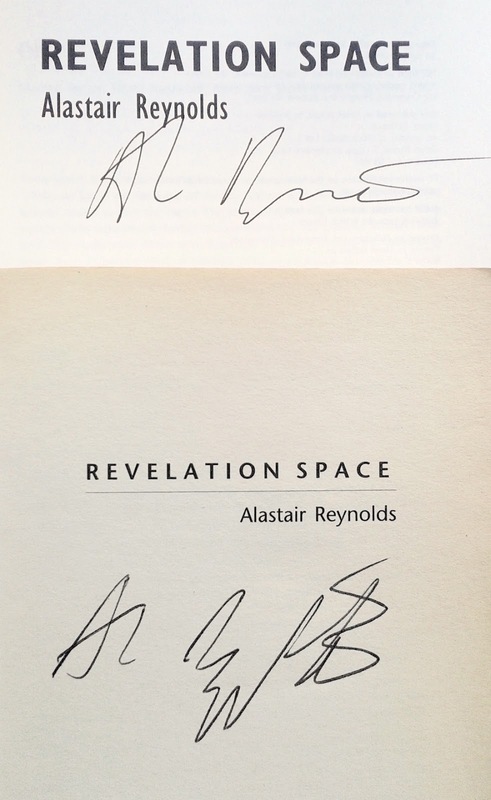 But my best scores have been made online, notably a hardback first edition of Revelation Space itself, which, according to some sources, only had a print run of around a thousand copies – it was, after all, a debut novel by a relatively unknown writer – and which as a consequence has become quite scarce and pricey; I managed to secure a nice copy for a tenner. 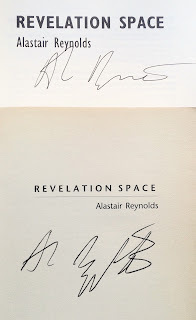 Naturally, me being me, I've acquired some signed books as well: a 2000 first trade paperback printing of Revelation Space, bought for the princely sum of one pence (plus postage); a 2001 first paperback printing of the same novel, bought for £7.25 (if you're wondering at this point what on earth possessed me to buy another two copies – albeit signed ones – of a novel I already owned in hardback first, you evidently haven't read Existential Ennui before); a pristine 2001 hardback first edition of Chasm City – at £20 my most expensive Revelation Space universe purchase, but still, I reckon, something of a bargain. Although maybe not as much of a bargain as my most recent Revelation Space universe acquisition – a 2001 PS Publishing hardback first of the novella Diamond Dogs, dust jacket by David A. Hardy: limited to just 400 copies (in hardback; there were also 500 paperbacks) and signed by both Reynolds and Stephen Baxter – who provides an introduction – it set me back a fiver. 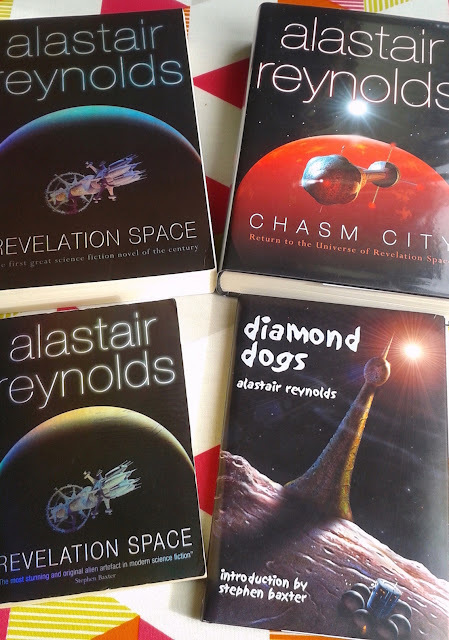 Though I've a good many Revelation Space universe stories still to read (and a number of first editions still to collect), I suspect Diamond Dogs – a brilliant and disturbing tale of obsession that really got its hooks into me – will remain a firm – if not overall – favourite, for reasons I'll expand on in a subsequent post. NB: Linked in this Friday's Forgotten Books round-up. Well, I know where to come (here) when I decide to seriously pursue more science fiction. Which I want to do but there is only so much reading and blogging one person with a full time job can do, so it may be a while.